In Spring 2015 I will lecture in the the DTU master course 01618: Dynamical Systems II , and also in the DTU bachelor course 02526: Mathematical Modelling, which will involve co-learning with students from Korean Advanced Institute of Science and Technology (KAIST) . 2009-2011 I lectured in the course 01332: Mathematics 2: Differential Equations and Infinite Series. I lecture at the University Extension in Copenhagen ("Folkeuniversitetet"). Here are slides from some pdf versions of lectures I have given there. I speak to visiting high schools and about the excitement of mathematics, the natural sciences, and technological research. 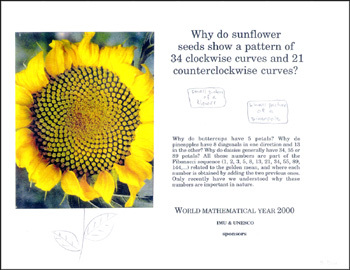 In 2001 I appeared briefly in a TV-programe which discussed some of the mathematics associated with patterns in nature. The surfer interested in more details re the answer to the question posed on the image above (i.e., many more details than is given in the tv-program) is referred to the superb web page of R. Knott , University of Surrey.